The happiest song from this great work, now arranged with a choice of soloist! 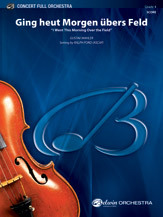 In this expanded setting, the transparency of the original is maintained, providing the perfect place to add the soloist. Vocal, B-flat, F, or B.C. solo parts are provided, or the piece can be played without a soloist. The harp part is integral to the arrangement but can be performed on synth.